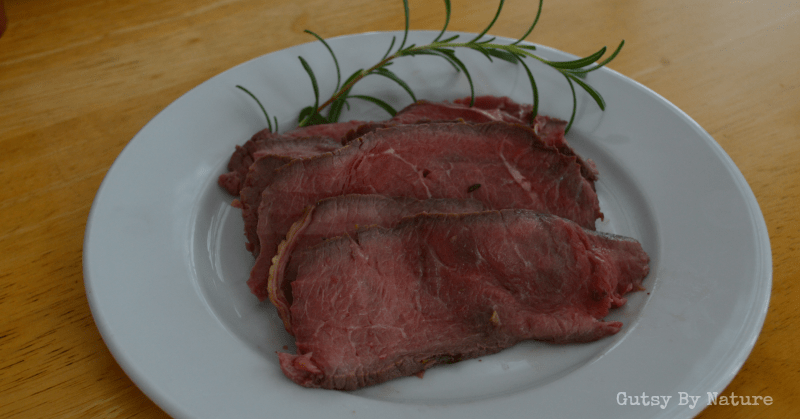 This recipe for garlic and rosemary roast beef is dead simple to make and so tasty! I used grass-fed sirloin tip roast, but you could make this with any of the lean cuts that tend to be tough if not handled properly, including rump roast, cross-rib roasts, sirloin roasts, and top round. The basic template for this recipe is found in my favorite reference for dealing with unfamiliar cuts of grass-fed beef (as well as pork, lamb, game, and other meats), Bruce Aidell’s The Great Meat Cookbook: Everything You Need to Know to Buy and Cook Today’s Meat . If you eat meat and don’t have this cookbook on your bookshelf, you are missing out! Cooking these leaner cuts beyond medium-rare is not advised. If you want well-done meat, make a pot roast instead. Cut slices as thin as possible, especially if you are using a tough cut like sirloin tip. An electric knife can make this easier. You don’t want to overcook this roast, so use a cable-type digital continuous read thermometer (I recommend the one below). If you don’t have one, make sure you check the temperature after 45 minutes of roasting and then every 10 minutes after that. 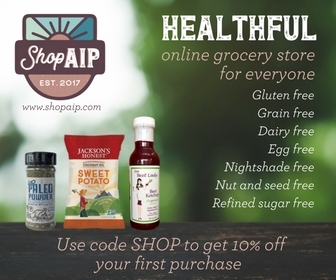 Paleo autoimmune protocol (AIP): This recipe conforms to the requirements of the elimination phase of AIP, as described in The Paleo Approach. If you have reintroduced black pepper, feel free to add it in the first step. Specific Carbohydrate Diet (SCD): This recipe is SCD legal. Low-FODMAPs: Eliminate the garlic, or use infused garlic oil instead to get the garlic flavor without FODMAPs. 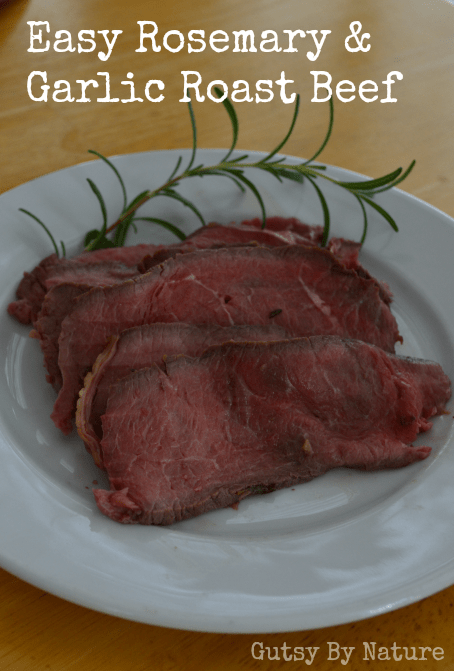 Great way to prepare lean grass-fed beef cuts like sirloin tip roasts! With a mortar and pestle, smash the garlic with the salt into a paste. Mix in the minced rosemary, crushing it a bit to release flavors. Rub the garlic and rosemary paste onto the roast, spreading it evenly. Let the roast sit at room temperature for 2-3 hours. Preheat oven to 250 degrees. While the oven is preheating, heat cooking fat in a large oven-safe skillet over medium-high heat. Add the roast and brown it for 2-3 minutes per side. Insert a cable-type digital continuous read thermometer into the meat and then place the skillet in the oven. Remove roast from oven when the temperature reaches 120 degrees (this will vary depending on the size of your roast and variances in ovens - it takes about an hour for a 3 pound roast in my oven). Tent roast with aluminum foil and allow to rest for 15-20 minutes, or until the temperature has risen to about 125 degrees. Slice as thin as possible for serving (using an electric knife or a meat slicer works well).